The best Dentist Kirkland has around, Dr. Pauley, is a favorite family dentist! To celebrate Children’s Dental Health Month, here are a few key facts about baby teeth. When your child is born, all 20 baby teeth are already there, just waiting for their big day. Those baby teeth will begin to emerge starting at about 6-8 months (sometimes sooner) through the first 3 years. 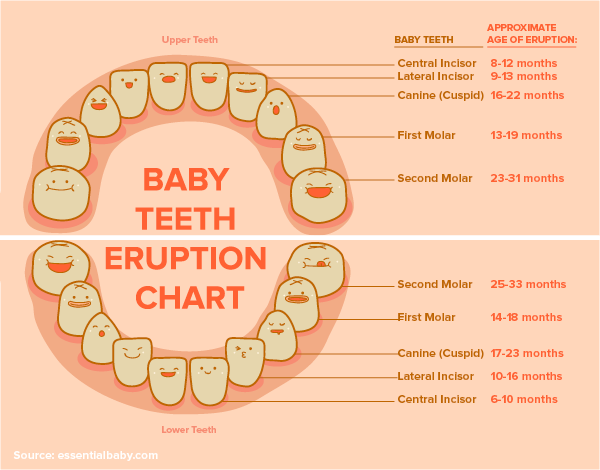 Here’s a chart to show the approximate timeline for your child’s teeth to emerge. Starting at 4-6 years, these baby teeth will begin to fall out, making way for the permanent teeth. Even though your child’s baby teeth will eventually fall out, they play a very important part in the lifelong dental health of your son or daughter. It’s up to you to make sure they stay healthy and cavity-free! • Act as placeholders for adult teeth. • Help with proper speech development. • Give your child the opportunity to learn a lifetime of good oral hygiene. When should I schedule my child’s first dental visit with Dr. Pauley? You can schedule your baby’s first appointment in our Bellevue office as soon as the first tooth emerges. We suggest you schedule this first dental appointment by the time your child is a year old. While most children start to have teeth emerge before they are 12 months old, it’s not uncommon for baby teeth to take longer. You are welcome to schedule time with Dr. Pauley to be certain there is no underlying medical issue, but there’s no harm in waiting a few months before taking this step. Chances are, that first tooth will show up soon! Use a soft-bristled, infant toothbrush with a tiny amount of non-fluoride toothpaste once a day at bedtime. This helps eliminate bacteria from the teeth. Bacteria is the culprit that can cause tooth decay. This will also get your child used to the idea of brushing. Wait until your son or daughter is at least three years old and knows not to swallow toothpaste before using a fluoride paste. If you have questions about caring for those all of those important baby teeth, please call the best Dentist Kirkland has, at (425) 643-2818. After all, that’s why we are here – we’re happy to serve you and your family! It gives lots of information about Baby Teeth. Thank you so much for sharing this useful blog.